Last night the boys asked if they could sleep in the basement. Scanning the calendar and verifying that we had nothing on the agenda for today, I determined that it would be okay. Let me explain, we can't have ball games or any outings for the following day ... because when they sleep in the basement they usually stay up until all hours of the night playing video games or watching TV and are virtually useless the next day. Responsible parenting? Probably not. But, I never claimed to be a responsible parent. Anyway, Big Daddy was in a pretty good mood and went down to help them out. Ya know, getting their blankets and pillows set out just right. What I saw when he came upstairs is something I've never seen before. He had turned white as a ghost. With wide eyes and barely able to speak, he mumbled, "Have you seen the basement?" Quite honestly, I probably hadn't been down there for two weeks ... but know that I send the kids down there to play daily. Judging from Big Daddy's face, I knew that it couldn't be good. I crept down, expecting the worst. And it was worse than THAT. "Appalling" is the only word to describe it. So ... guess what we are doing today? You got it. I'm goin' in. If you don't hear from me in 48 hours ... call 9-1-1. ... and I'm not lying either. I don't think Target would use a photo like this to advertise their goods ... ya know, otherwise it would have to read, "Cat and cords not included." Did I tell you I love Big Daddy? And not just because he buys me things either. Yes, No ... Maybe So? If I swapped out the white candles for a deep red, do you think this could work? I know most of you went for putting a piece of art work up there, but it just wouldn't work. The ceiling is too low and the hole too wide, therefore, making it difficult to find something that would fit. A lot of you suggested a TV there ... but mine is already here. And if you have no idea what I'm talking about ... I'm referring to this. So ... YES? NO? Maybe so? 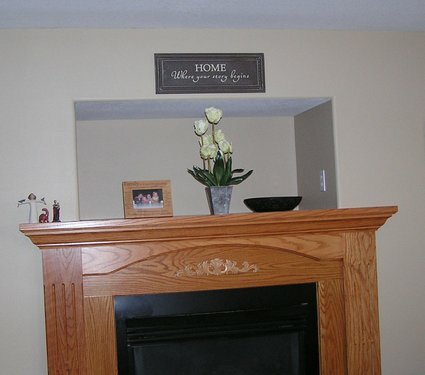 When designing fireplaces and their mantels, who in the world decided it would be a good idea to put a "hole" so to speak, above the fireplace behind the mantel? WHO? I really want to know who's ideas this was ... so I can find that person and slap them upside the head. I've had one of these "holes" above my fireplace for 11 years now. ELEVEN. And I used to place numerous photos in pretty frames, in an pleasing formation. So, tell me. What the hell am I supposed to do with this? I need this hole, like I need a hole in my head. Even though a hole in my head sounds somewhat appealing when trying to figure out what to do with this hole above my fireplace. Just being honest here. I mean, really, isn't it bad enough that the fireplace and mantel is uglier than sin ... that they had to add a HOLE above it? Seriously. I'm asking. Ideas, please. 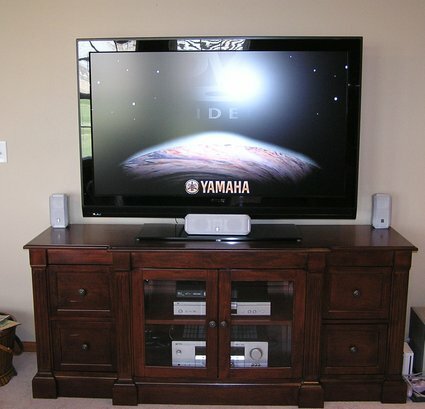 If you have this same set up, share a picture, because I'm at a loss ... and for once ... in 11 years, I'd like to have this dilemma fixed. Then we'll move on to the curtains. Last weekend, our schedule was full. And by full ... I mean, FULL. Jake had a double header in Muscatine on Saturday and well as his first flag football game on Sunday afternoon. Drew had his first soccer game Saturday morning and his flag football game on Saturday afternoon. Big Daddy and I would be going in opposite directions the entire weekend. And it rained and rained. And then rained some more. Soccer was canceled. Then football. Then finally baseball. We were given a gift. A gift of a weekend. It would have been a crime to waste it. Right? So I suggested Big Daddy paint the kitchen and living room. The colors have been picked for months. The new curtains and rod for the living room were waiting patiently in the garage. He moaned. Then groaned. Said "no" about 15 times. Then I did what every woman should do when their husband says they won't paint when they really really want them to. I fell on the floor, kicked my legs and flailed my arms, opened my mouth as wide as I could and tantrumed like a 2 year old. Wait, more like a 3 year old. I think the art of this tactic should be taught in a premarital seminar that every wife-to-be must attend. I just happen to be lucky that I've had so much experience with these types of tantrums, that I've got it mastered. Down to a science, actually. Then he hung my new curtain rod. And the curtains I've had purchased and waiting to be hung don't work. 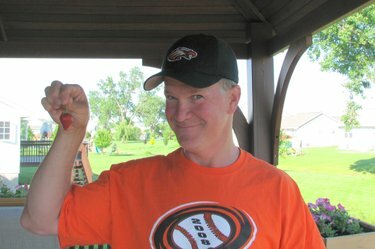 Not to mention that Big Daddy treated himself to a little somethin' somethin' for all the time and effort he put in. Turns out he is pretty darned happy. 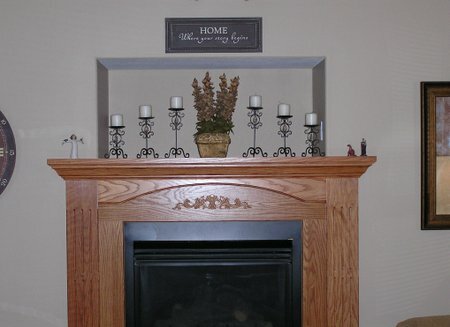 Oh, and a fireplace mantel that is driving me crazy. There's always a price, isn't there? While I do have some blog worthy things to share with you ... I don't have the time to actually blog them. Who's idea was it anyway to give my 10 year old a party with 18 of his closest friends? That person needs to get a clue. Or at the very least, a brain. 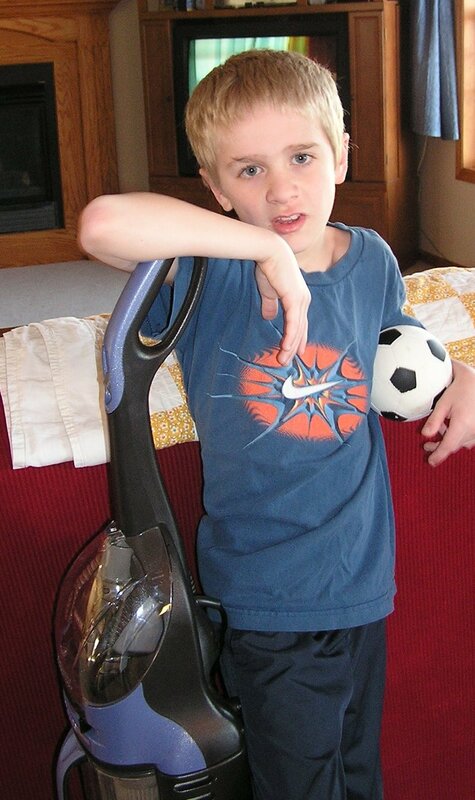 So, anyway, the other day Jake was vacuuming. 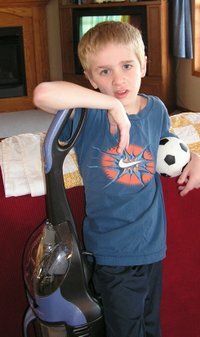 Drew usually does the vacuuming because he likes it. My miniature Big Daddy. 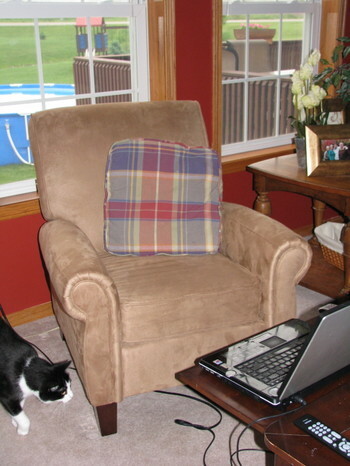 But, that particular morning Drew was at soccer practice and the main floor hadn't been vacuumed yet, and even though Jessie is hanging out at Rainbow Bridge waiting for us, I still insist on vacuuming the main floor every single day. And Jake was assigned the duty. When he was finished, he came to me with a rather glum face. "Mom, I'm done. I stink at vacuuming. My lines aren't very straight." I hugged him. "Practice makes perfect, my dear." Poor kid. He inherited Big Daddy's genes. He'll make some woman very happy one day.